Viewing the name of a dog registered through the American Kennel Club (AKC) can be confusing. 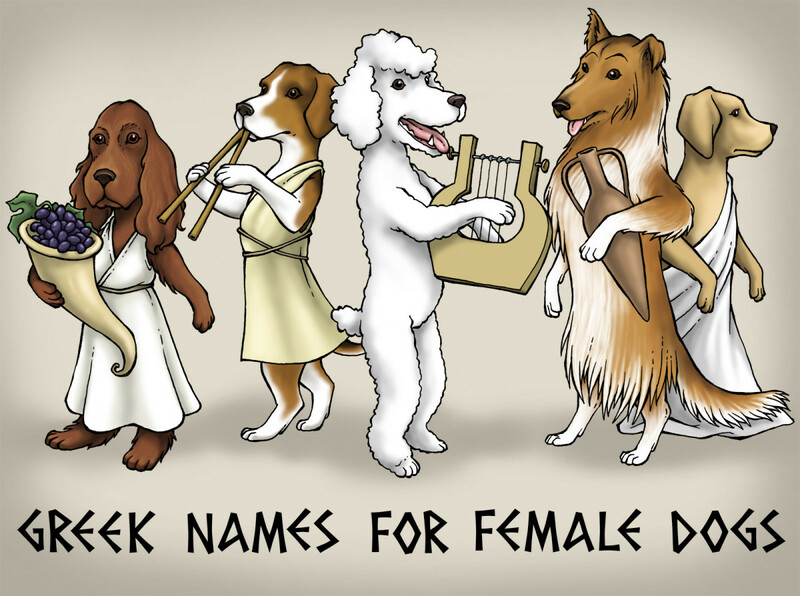 For some dogs, there's a funny, formal name surrounded by what looks like initials. To the uninitated into dog sports, this may seem like someone's fingers slipped on the keyboard...and often. But to people in the dog world, these letters signify great accomplishments and times of fun with their best furred friends. 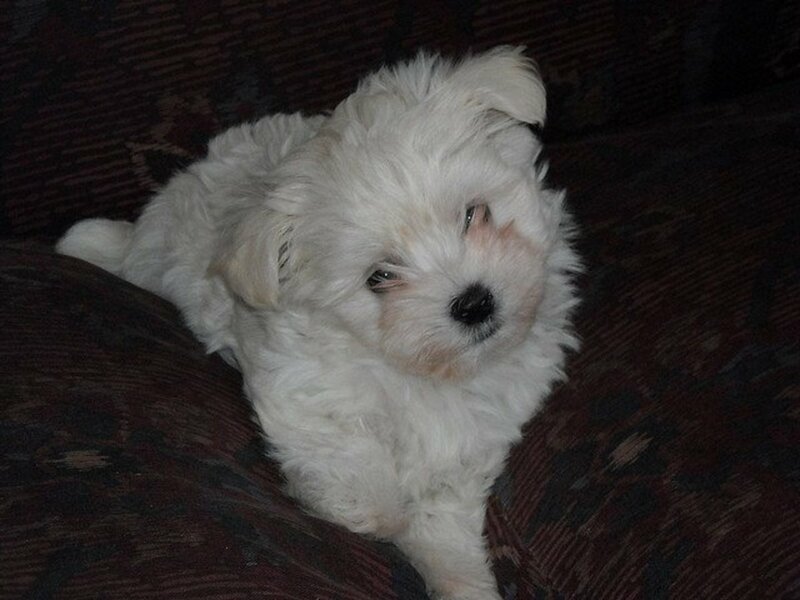 To decipher the alphabet soup of titles, let's examine the name of my dog, Aslan. His registered name is simply "Deepfork's Aslan." A registered name is the formal name you fill out on the form to send to the AKC when registering your dog. Registered names are sometimes quite long, and often the name of the kennel where the dog was bred or lives is listed first or last in the name. For instance, all of my dogs have "Deepfork's" in their registered name as that's my "kennel" (although I don't breed or own actual kennels). So Aslan's registered name is "Deepfork's Aslan." Aside from his registered name, Aslan has a bunch of initials surrounding his name. These initials are monikers for "titles." Titles are achievements won through competition. These competitions can include, but are not limited to, dog sports such as obedience, agility, conformation, lure coursing, herding, Rally, field, etc. Even therapy dogs can get official titles now. Any pure bred dog or mix can also get registered through the AKC and earn titles. In performance events, mutts can compete right along with their pure bred counterparts. Anyone who understands these initials can immediately tell a whole lot about Aslan. There are a bunch of agility titles in his name. Obviously, he is an agility dog, and a pretty good one as the highest agility title available through the AKC is listed and has been earned four times over - the MACH4 (Master Agility CHampion title). Championship titles get listed before the dog's name to honor those outstanding achievements. The rest of the lower level titles get listed behind the dog's name. Based on the titles, we can assume he first competed in agility for years in the regular jump height, but was moved down into a lower jump height as he became older. The titles with the letter "P" at the end indicate the "preferred" class - often entered by veterans - and also hint at a long agility career. We can see he earned two Preferred Championship titles by the PACH2 (Preferred Agility CHampion) at the beginning of his name. 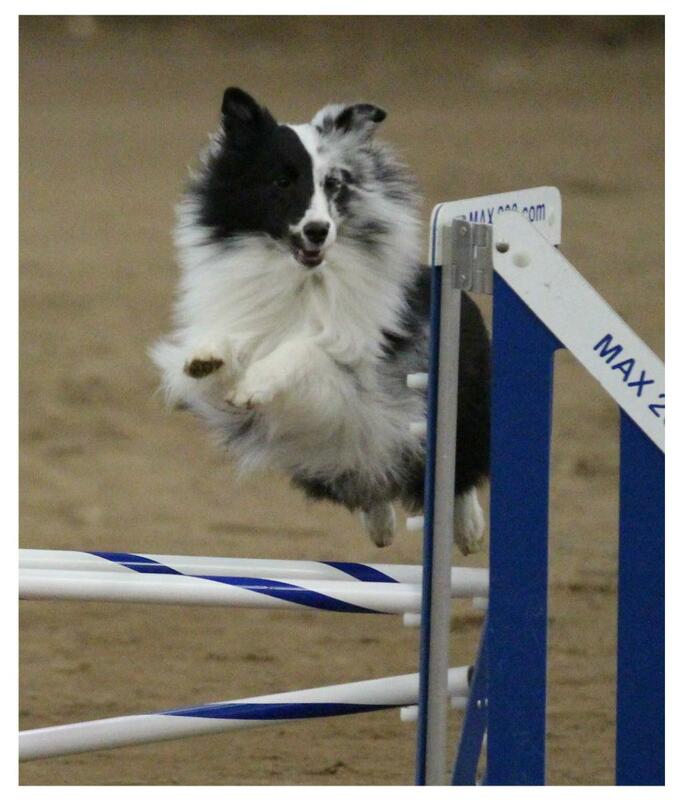 He is a dog proficient at distance work in agility, and yet he is accurate - as proven by the TQX title. The T2BP title tells us Aslan is pretty fast, too.. There's more information there. Aslan also competed in Rally Obedience, and at a pretty high level as shown by the RAE and R2CL titles. The RAE is the AKC's highest Rally title. In addition, we can tell that at some point Aslan was certified as a therapy dog, so he must have a good temperament. The titles also tell us Aslan didn't just compete in agility in AKC, but he competed in some other venues, at least nominally. Mostly the above name shows that Aslan is greatly loved and highly trained. Someone values and loves him very much to spend that many hours with him training. The sheer number of titles show that there is a strong bond between Aslan and his owner. Titles speak strongly of the love an owner has for her dog, and vice versa. Only the highest level titles are shown, and each title can represent four or five lower level titles already earned. While it may look like Aslan has only earned 25 titles, in fact he has earned 77 titles and two certifications!! That explains what a title is and how it is listed in a dog's registered name, but for the braver of heart, let's get a little deeper and more specific. Looking just at the American Kennel Club's agility program, what are the titles that can be earned there? To do this, let's look at the different classes offered. Classes are simply agility games you can enter at a show with your dog. 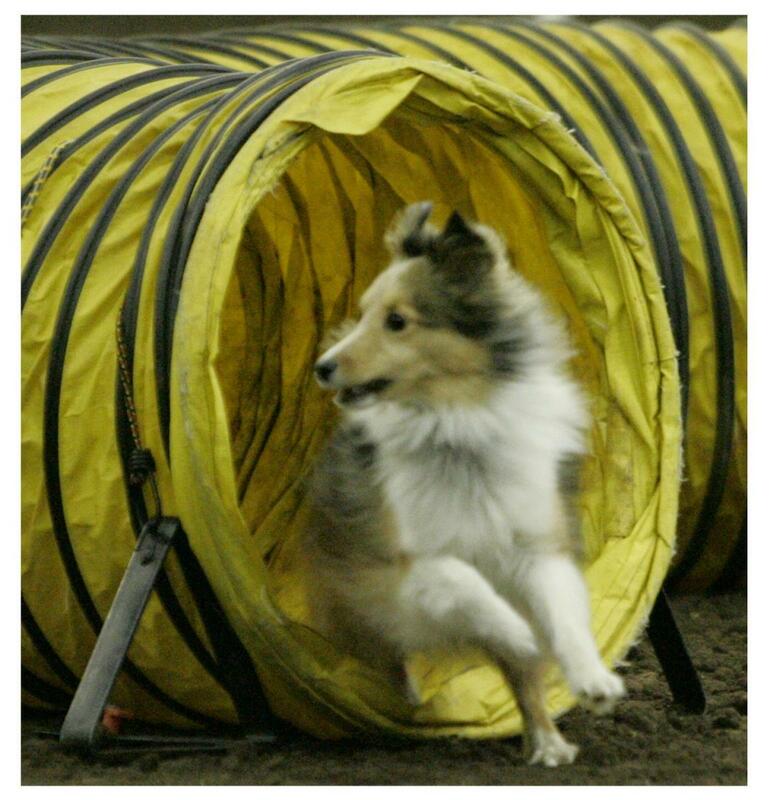 For instance, the Standard class will offer teams the opportunity to run all of the usual agility obstacles in a course at a trial (A Frame, Weaves, Tunnel, Jumps, Table, Dogwalk, Chute, etc. See the video above to view the obstacles.) 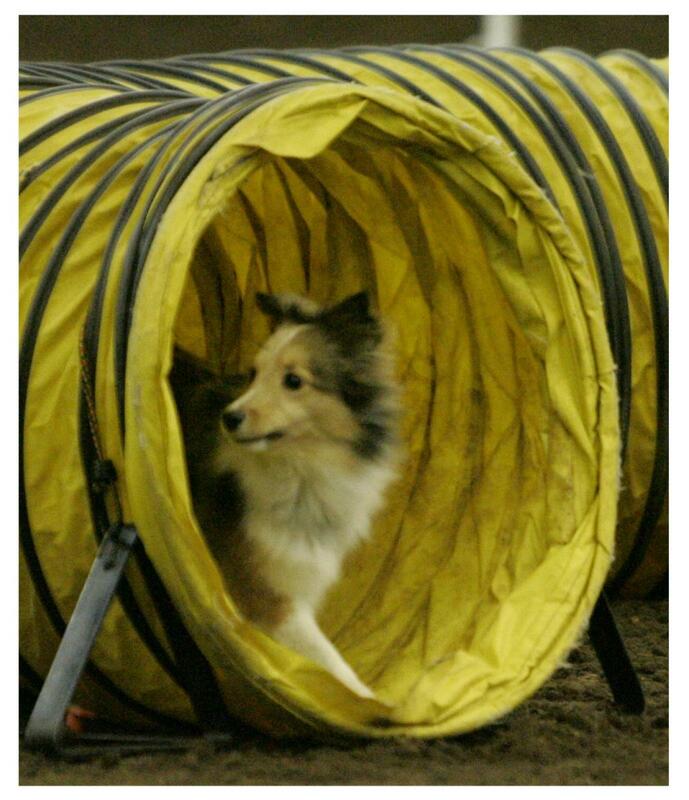 I could enter my dog in that class and know all of the agility obstacles will be present. I also might want to enter another class called FAST (Fifteen and Send Time). This class can have a variety of agility obstacles in it, but it is different because somewhere on the course a line has been set down. The handler is not allowed to cross this line, yet the dog must leave the handler and go out past the line at distance to perform correctly a series of obstacles. FAST classes are great for teams that have powerful distance handling skills. (See above video for example). I might want to enter a class called Time 2 Beat (T2B). In this class, the fastest dog earns a full 10 points, and all other slower dogs who qualify will get fewer points based on how many seconds their time is behind the first dog. This is a great class for fast dogs with courses designed to encourage speed. Finally, I might want to enter the Premier class. This class offers more difficult "handler challenges," and the courses are often tighter and considered harder to run without mistakes. This is a fun class for teams with more advanced skills. Within those six classes - sometimes called "games" - come the variety of titles available through the AKC. BUT it's not over yet!! Within each class, several levels of titles are available. Let's look just at Standard agility. Since dogs and people learn agility slowly and over time, encouragement is given as the teams rise through the ranks. This encouragement is in the form of titles. The first level title is the Novice - or beginning - title. The Intermediate level title is called the "Open" title. The advanced level title is called the "Excellent" title. The "Masters" title is for the elite teams. And of course, the Champion title is reserved for, well, the champions! A dog must earn the novice title before going on to earn the open title, which must be earned before getting the excellent title and so on. So in a dog's registered name, if the title MACH appears, it indicates that the novice, open, excellent and masters titles were all earned too, even if those initials no longer appear in the dog's registered name. Only the highest level title appears in the registered name. But, there is even more. There are two jumping levels that dogs may compete at within the AKC. The regular level has the dogs jumping at a height based on where the dog measures at the top of his shoulders (withers). Aslan, who measures 12.3" at the withers, has a regular jump height of 12". He only competes against other dogs who measure into his jump height. Now that he's older, he has been moved into the "Preferred" jump height. This jump height is four inches lower than the regular jump height, and five seconds is added onto the time to run an agility course. Therefore, as a senior citizen, Aslan can safely continue to compete - and gain even more agility titles. 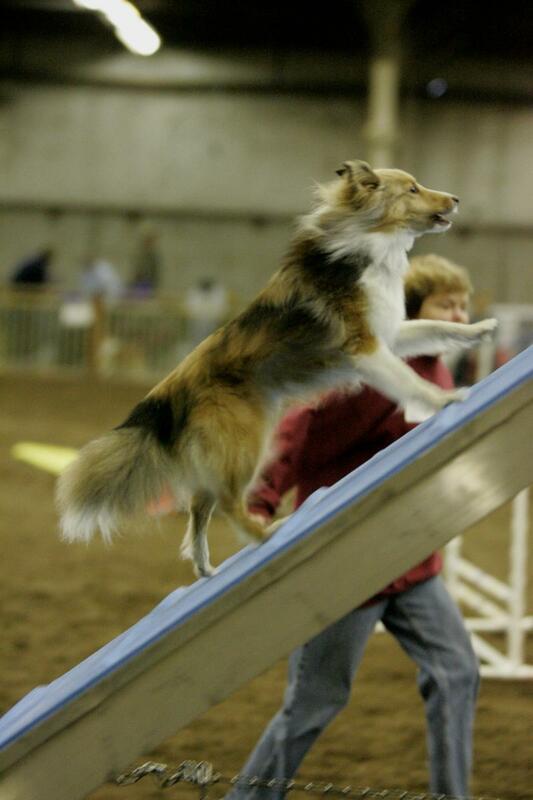 For every AKC agility title listed in this article, there is a "Preferred" equivalent. Any title with a "P" in it indicates it was earned by a dog running in "preferred" - four inches lower than its normal jump height. How are these titles earned? What does a dog have to do to get them? At every trial, original courses are built. The handlers have never seen the courses, nor have the dogs. The handlers have to figure out how to get their dogs around the course with as few errors as possible. Errors may include (but are not limited to) a dog stopping forward motion before an obstacle (refusal), a dog dropping a bar, a dog running past an obstacle (run out), a dog taking an obstacle out of sequence (wrong course), a dog jumping too high off of some obstacles (blowing a contact), a dog coming off of the table early, etc. At each level of agility - Novice, Open, Excellent and Masters - different requirements are present for the dog to "qualify" or pass the agility course presented on any given day. Let's say my dog is entered in the Novice Standard class. In order for us to "qualify," we will need to have 85 points out of 100. We will get five points off for any refusal/run out, wrong course and table fault. We can only get two of any one mistake. For example we could earn two refusals and one wrong course, and still qualify. But we couldn't have three refusals and still qualify. If the dog drops a bar, doesn't put a paw in the yellow "contact zone" on the larger pieces of equipment, leaves the ring, jumps off the teeter before it has landed or a number of other errors, we will not qualify outright. We could also go over time with one point removed for every second over time. If we were in the Masters level, we can have no errors of any kind. To qualify at that high level, you have to run clean and be under time. 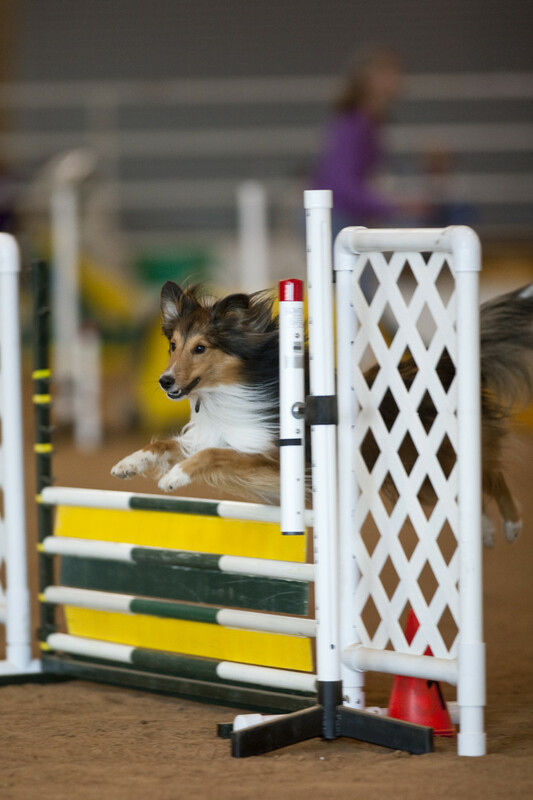 The Novice dogs run Novice courses that are smaller and easier. The Masters dogs run Masters level courses that are bigger, tighter and more difficult. Agility actually is about what happens between obstacles as the handler shows the dog through very small and micro-second movements where the next obstacle is. With fast dogs, even a very slight body movement can send a dog off course. 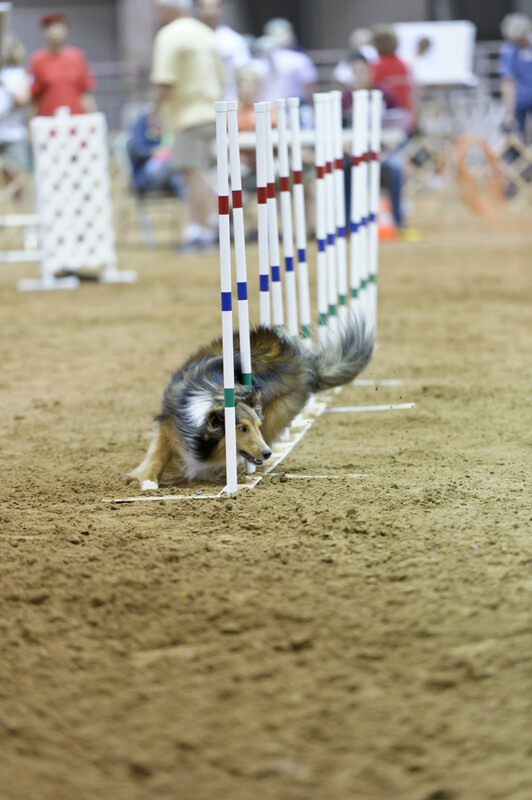 Agility competitors often say agility is the hardest thing they have ever done. It's one of those sports that looks much easier than it actually is! Why is qualifying important? Because in order to earn titles, dogs must qualify in their level/class. So for my Novice dog to earn a title, he has to earn a score of 85 or above three times and under two different judges. Confused? Below is a table that will clarify things. Requires 20 QQs and 750 speed pts. To earn a Q (qualifying run) in Novice Std., a score of 85 is needed with five points off for each refusal/run out, wrong course and table fault, but no more than 2 refusals/runouts, 1 wrong course or 2 table faults. One fault point is taken for each second over course time. To earn a Q in Open Std., a score of 85 is needed with five points off for each refusal/run out, wrong course and table fault, but no more than 1 refusals/runouts, 1 wrong course or 1 table faults. Two fault points are taken for each second over course time. To earn a Q in Masters Std., a score of 100 is needed. The dog must run clean and under course time. To earn a MACH (Championship) a team has to qualify in both the Standard and JWW classes out of the Masters class on the same day 20 times (called a Double Q) plus earn 750 speed points. A speed point is earned for every second a dog comes in under standard course time for qualifying runs only. To earn a Q in Novice JWW, a score of 85 is needed with five points off for each refusal/run out, but no more than 2 refusals/run outs. No wrong courses allowed. One fault point is taken for each second over course time. To earn a Q in Open JWW, a score of 85 is needed with five points off for each refusal/run out, but no more than 1 refusals/run outs. No wrong courses allowed. Two fault points are taken for each second over course time. To earn a Q in Masters JWW, a score of 100 is needed. The dog must run clean and under course time. To earn a MACH (Championship) a team has to qualify in both the Standard and JWW classes on the same day 20 times (called a Double Q) plus earn 750 speed points. A speed point is earned for every second a dog comes in under standard course time for qualifying runs only. To earn a Q in Novice FAST, a score of 50 is needed including completing the distance "send" for 20 of those points. Points are accumulated by completing obstacles. To earn a Q in Open FAST, a score of 55 is needed including completing the distance "send" for 20 of these points. Points are accumulated by completing obstacles. To earn a Q in Excellent FAST, a score of 60 is needed including completing the distance "send" for 20 of these points. Points are accumulated by completing obstacles. To earn a Q in Masters FAST, a score of 60 is needed including completing the distance "send" for 20 of these points. Points are accumulated by completing obstacles. To earn the TQX title (Triple Q Excellent), a dog must qualify in Standard, JWW and FAST all on the same day and all out of the Masters class 10 times. Another agility game in the AKC is Time 2 Beat. This title is a bit different, as there are no experience "levels." All dogs from Novice dogs up to Champion dogs compete on the same course against each other. The fastest dog "wins" and earns 10 T2B points. All other dogs who qualify with slower times earn lesser T2B points based on how far behind the fastest time they were. Hence the name of the class, "Time 2 Beat." To earn the T2B title, a dog must earn 15 qualifying runs and have 100 T2B points. The title can be earned over and over, and a number at the end of the name will denote how many times the title has been earned (T2B2, T2B3, T2B4, etc.). 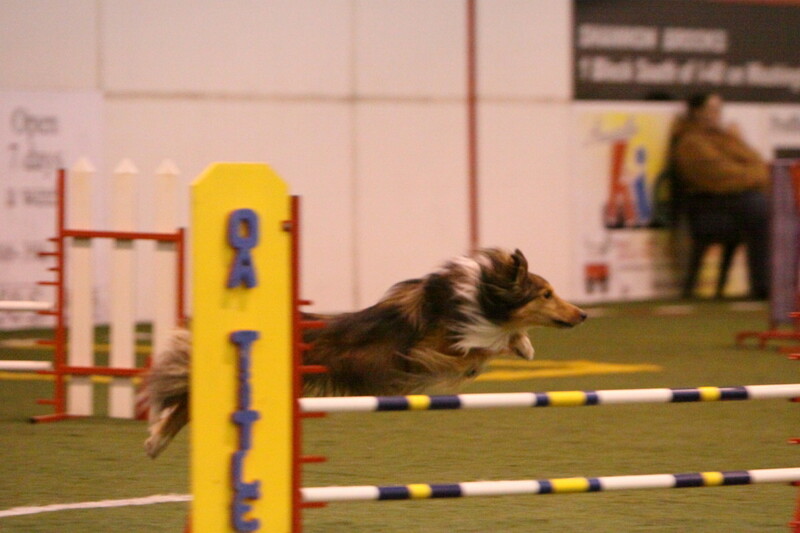 Asher, a sheltie, flying over an agility jump. For more dog info, check out akc.org. Have you put a competition title of any sort on your dog? Yes!! I have at least one title on one of my current or past dogs. Several other titles also can have numbers at their end, signifying that the title has been earned twice, three times, four times, etc. For example, a MACH5 is an agility championship that has been earned five times. Not all titles allow numbers after the names, but if you see a number after a title, you'll know what that signifies. A few titles have been left out of the discussion such as the PAX and the Premier titles. You can read about them at the AKC's website - akc.org. Here is a list of some of the Preferred titles. You can subtract the "P" and find their equivalent and the requirements for the titles in the tables above. NAP, NJP, NFP, OAP, OJP, OFP, AXP, AXJP, XFP, MXP, MXJP, MXFP, PACH, TQXP, T2BP. 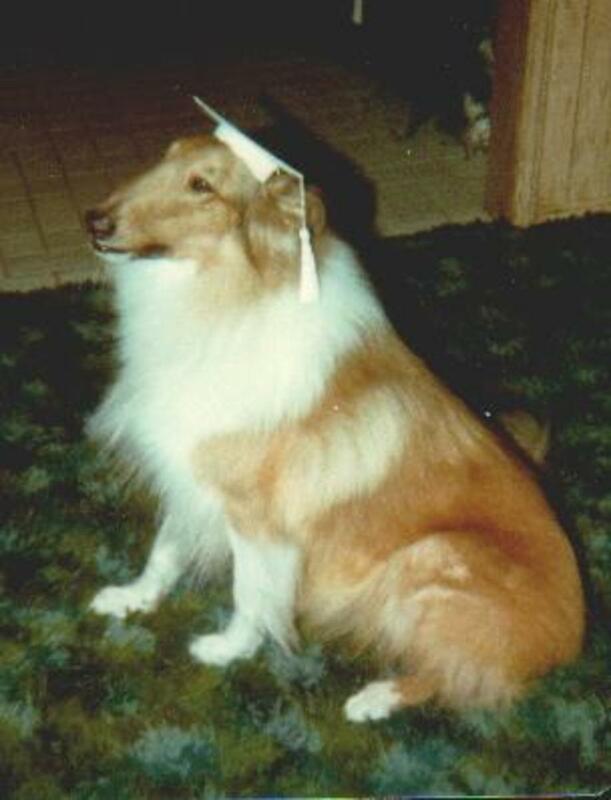 The AKC has just initiated a new program called the "Lifetime Achievement Awards." Also known as "the metallics," these title recognize the number of qualifying runs a dog may have in any given class in the Masters level. Because of the newness and the difficulty to decipher these titles, a different article has been written about them. Also, titles are constantly under revision by the AKC. As new games join the ranks, new titles and title combinations - like the TQX - are being added. This makes agility more fun for the goal oriented handler, but it does mean the alphabet soup gets more letters and confusion. Agility is a relatively new sport, and as such, it is still being developed. To get the absolute latest on title requirements in even more detail than this article, click here to read the "AKC Agility Rules and Regulations" booklet. Agility is a sport for all people. Whether a superb athlete or a person in a wheelchair, dogs can be trained to navigate an agility course with their handlers. Agility is now open to all dogs - mixes and purebreds alike. Best of all, it's highly addictive for both teammates and gives the owner a chance to spend some wonderful, quality time with their best furred friend. If your dog isn't already in agility, consider getting into training and win a few of those initials at the end of your dog's name. You both will gain wonderful memories, meet great friends and have a fantastic time together. If you get 20 cues in master, is that a title? I believe it depends on whether you are in preferred Masters or regular Masters. In regular Masters, you get a title at 25 qualifying scores. The MXB title is the Masters bronze title. In preferred, you used to be able to get a title at 20 qualifying scores. I don't know if this title still is available. It was called something like Masters Excellent Standard Preferred 2 (MXP2). My dog has several AKC titles along with other venues such as NACSW and USCSS. Is it proper (or ok) to add those titles to her name. Not officially through AKC of course but for my sake, bragging rights? If so, what order? Highest to lowest? Any particular order of venue; AKC, NACSW, USCSS? Thanks! I never competed in agility; but once I get the right dog I may give it a try, awesome hub, voted up! Aslan Rocks! Great hub here. Agility is one of my favorite events. My Frenchie's just aren't really suited for it though even if they think they are. Do you have any titles or certifications on your dog? Comment and tell us about his/her achievements!! !